One glaring benefit of a digital hanging scale that is rarely highlighted is the great efficiency gained. Normally, when weighing equipment, goods or pieces, the operator must lift the item, transport it to the scale platform, record the measurement, and then remove it and place the item in its final position, whether it be on a shelf, warehouse floor, or train. This is almost inconsequential when weighing light items that can be carried by hand, however, when moving things that require a forklift or crane, such as in the steel industry, working with livestock, or in shipyards, etc., a hanging scale cuts out most of those steps and hours from the workday! By attaching a hanging scale to a crane you can complete two steps in one: transport the goods to their new location and record their weight via WiFi or Bluetooth all in one movement. Using a digital hanging scale is an exceptional time-saver that can, in turn, save you money. Another strongly compelling benefit of digital hanging scales is that they can be used outdoors. The versatility of a portable scale like this makes them a very attractive option, even for industries that don’t normally require hanging scales because you never know when one is going to come in handy. 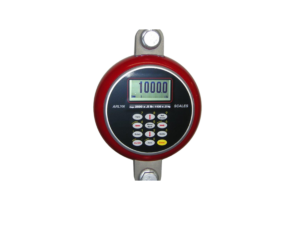 Note that the Arlyn Series Crane Scale housing is made of aircraft-grade aluminum in easy-to-spot red polyurethane cover, is water resistant and can operate in temperatures from 14ºF to 104ºF. The load cell censor, however, is of stainless steel for durability and corrosion resistance. The following is the capacity of each of our three hanging crane scales and their accuracy. For all of the details, see the Arlyn Series Crane Scale specs sheet. ARC-2500 2,500 lb. x .5 lb. ARC-5000 5,000 lb. x 1 lb. ARC-10000 10,000 lb. x 2 lb. Furthermore, the fact that the scale is suspended and there is no external pressure from the ground or any other source, gives near perfect measurements. While digital scales are more accurate and much faster to get a reading than analog scales, the technology behind new scales is really what has boosted most industries. Our scales today are battery-powered and optional Bluetooth-enabled. The Arlyn Crane Scale only needs to charge for four hours per approximately every 100 hours of use! You can also program the digital scale to count parts, the console features a setpoint controller and pushbutton tare and unit conversion. Arlyn Scales offers optional swivel shackles and hooks to match your specific needs. For instance, we offer a J-hook (rated for 4 times its maximum load capacity) with a safety catch that is designed to pivot. You can, optionally, also use a USB to transfer data or you can request printer connections. Some of the hanging scales are offered with software for interface with a PC or laptop. Arlyn Scales has been innovating in scale technology for 40 years. We manufacture our own scales and all subassemblies are done in-house in our factory in Long Island, New York. Sales and customizations are seamless since we keep it all within the company. This factory-direct pricing means that there is no outside sales team or distributor to markup your costs. Call us at 800-645-4301 to tell us about your business and take advantage of our 40 years of experience serving clients in all manner of industries – including yours!